I don’t usually do many thematic videos, but with Christmas right around the corner, it was a good excuse to talk about a Christmas anime, or at least an anime that takes place near Christmas. Actually, this movie starts its story on December 16th, which was very convenient for me because, well, that’s when I was able to release the review. I’ve sat on this script, or some rendition of it, for a long while, nearly a year, because for me it has become a New Year’s tradition to watch The Disappearance of Haruhi Suzumiya every January 1st. The fact that it’s become a tradition may already imply a certain something about the quality of the film, but nonetheless, let’s get to it. I guess minor spoiler warning for this movie’s prequel series, The Melancholy of Haruhi Suzumiya, which you should definitely watch before seeing this film, but I will only be giving away its basic premise, so feel free to stick around even if you haven’t seen any Haruhi. Our story begins, as it so often does, with a normal Japanese high schooler, this one nicknamed Kyon, and a member of the SOS Brigade, a school club devoted to the investigation of supposed otherworldly phenomena, founded by the titular Haruhi Suzumiya, a girl who is tired of the mundanity of normal life and is searching for something to liven it up. Aliens, time travelers, espers, things like that are so exciting! They must be out there somewhere, just waiting to be uncovered. Little does Haruhi know, they are much closer than she thinks, as the other three members of the Brigade, Yuki Nagato, Mikuru Asahina, and Itsuki Koizumi, are an alien, time traveler, and esper, respectively. Each one has been sent by their various organizations to keep an eye on Miss Suzumiya, and with Kyon’s help, put a stop to any trouble she might cause... because unbeknownst to Haruhi herself, she is a godlike being, able to subconsciously manipulate reality with just the force of her imagination. That’s the TV series, of which this film is a sequel to and finale. As you could infer from the title, one day Kyon wakes up, and Haruhi is gone. Not only is she not at school, no one remembers her and the SOS Brigade is not a thing. It’s as if she never even existed at all. This rightfully baffles Kyon because, well, wasn’t Haruhi God? Wasn’t she what the universe was revolving around? How could she just disappear? To make matters worse, Asahina doesn’t recognize him, Koizumi is nowhere to be found, and Nagato is completely unlike herself. 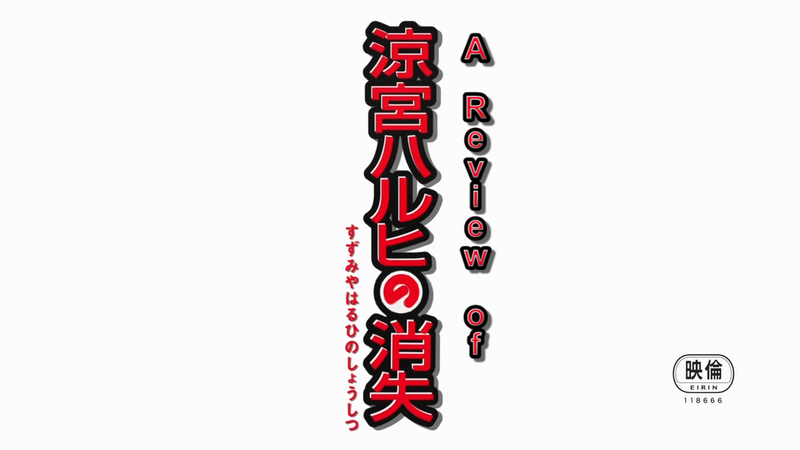 Left in a bizarre new world with no one to count on but himself, Kyon decides to find answers, and takes the first step on a long odyssey to bring Haruhi back. The first thing you have to talk about when it comes to this movie is Kyon himself, because the whole thing follows him. During the TV series, Kyon had always acted like he was being pulled along against his will and forced into all of Haruhi’s wacky antics. Always quick with a snide remark or sarcastic comment, Kyon had created an image that he would like nothing more than to rid himself of the massive nuisance that was Haruhi Suzumiya. But once he has found himself in that exact situation, he can’t stop himself from tearing his hair out looking for her, and he has to reconcile the fact that, while Haruhi’s finally gone, he’s not happy. He’s empty. That self-reflective journey is a slow build throughout the film, Kyon having to ask himself if really wants to go back to the old world, when this new one is all he’s ever said he wanted. The turning point of this development, the big climactic moment near the end of the film where he confronts his feelings once and for all… I can only describe it as transcendent. It’s an amazing scene. And with only that and just Kyon’s journey alone, this movie probably would still have been awesome, but he is not the only character to fall under the spotlight. This is just as much Nagato’s story. Nagato, in the old world, was a robot, an artificial being sent by an ambiguous higher intelligence somewhere out in space to act as an observer, and as part of her programming, her emotional response and inflections were subdued at best. She had a personality, but wasn’t exactly human. The new world Nagato, on the other hand, seems very human. She still loves books, but now she’ll get shy and embarrassed, and seems to actually have tangible wants. It’s hard to go beyond that and explain how Nagato’s character is ultimately fleshed out without getting into heavy spoilers, but events occur that make you realize, even in the old world, even when she had as much to say as toaster, Nagato wasn’t a thing. She had her own thoughts, and her own feelings. So at this point, there’s something I should probably confess. The sub vs. dub debate in general is always a tricky thing, because there’s a whole lot of different opinions. A good number of people will watch exclusively subs. An equally notable, if perhaps smaller, number of people watch exclusively dubs, or as many dubs as they can. Others will watch anime set in Japan in Japanese, and everything else in English. Still others might have those select few shows that they feel can only be properly experienced dubbed, but otherwise are diehard sub fans. But, Kyon is the centerpiece of both the TV series and this film, so his casting is absolutely critical, especially considering that, in Japanese, he is voiced by one of my favorite Japanese voice actors, Tomokazu Sugita. I love Sugita. I love him as JoJo, I love him as Gin, I even love him as a bust of St. George. I’m sure I’d love him as Kyon too, but one thing, or rather, one man, prevents that: Crispin Freeman. Freeman nails both Kyon’s serious and sardonic side so, so well, that every time I’ve watched this movie has been dubbed. I haven’t been able to convince myself to even once actually watch the Japanese, that’s how much I love the dub. You may disagree! A lot of people hate dubs on principle, which I think is silly and narrow minded, but it’s a thing, and I have neither the time nor the inclination to try and argue it, but I think this is a great dub. To get back to material of the film that exists in all languages, discounting the stellar character work as much as one can since it’s such a strong focus, the plot is one I also found compelling just as a plot. It’s a mystery you want to solve, of how this happened, how Haruhi disappeared. There probably aren’t any twists that will leave you leaning back mind blown, but it’s really cool how much it incorporates prior seemingly disconnected events of the series. The movie’s chockful of just little nods to the TV show, sure, but a lot of the actual plot beats are predicated on things that happened in the first two seasons. This isn’t an isolated story, it builds off of several things that the series established. The infamous Endless Eight, for example, plays a subtle but massive role in the chain of events. Hm, how can I be explain this better but still be vague… At one point in the show, Kyon time travels with Asahina. Won’t say what happens or why, but that time travel narrative was a small self-contained story with a beginning and an end, but that same story turns around to be important to the events of this movie in ways you would never expect, but make complete sense. And really, sense is what you want. If you try to weave together pre-existing plot threads into a nice little bow, it really has to make sense and not feel forced. This does not feel forced, it feels like an organic growth of events. And then, we have to remember that this is a Kyoto Animation film. Kyoto Animation, you say? You mean that studio that makes all those moe shows and Free? Yes. Yes I do. KyoAni’s work always looks f**king awesome. Putting aside the often excellent digital effects and detailed backgrounds, what KyoAni has a knack for is personal, intimate animation. Characters will move with such flow and nuance that it’s truly a sight to behold. So give ‘em a film budget, and they’ll go even further. This isn’t necessarily like a, say, Shinkai film, where every shot could be a wallpaper, but it is no less beautiful. It knows when to be mundane, when to be artsy, and when to be bombastic. This film looks great. The weaker part of the whole production, although by no means a bad part, would probably have to be the music. There are some neat remixes of themes from the TV series, and some new tracks that hit just the right notes to accentuate the mood, and the credits song is even this perfect somber-sounding serenade sung by Nagato herself, but I could never call it a fantastic soundtrack. I could, and would, call it an effective soundtrack, and even a powerful soundtrack, but it’s just not something I’d have much call or desire to listen to in its own right, outside of maybe one track. Is this partially because I’m just not the type for classical-ish material? Yes. Yeah, I admit that. If you’re the kind of person who can lay back and listen to an orchestra and like it, you’ll probably love the soundtrack. I’m just not that guy. This is a movie I’ve seen, at the time of this writing, four times (soon to be five) and of those four times, I’ve managed to identify literally only a couple things to call out here in “The Bad”, and the first isn’t even a flaw, so much as it is a warning. The Disappearance of Haruhi Suzumiya is long. So long, in fact, that it is the second longest animated film of all time, clocking in at 162 minutes. If you’re not good with the math, that’s just 18 minutes shy of 3 hours. I think this time is used very effectively, and I do not think the film drags… unintentionally, that is. The beginning chunk of the movie, when Haruhi is gone and Kyon is unable to do anything about it, is a little slow, but by design, to illustrate how the world is without Haruhi: just a dull slog. Brilliant, hats off to ya. I have no problem with that, I am actually very tolerant of slow material just in general, but if you’re not, and you like your anime clipping along, things outright happening every 10 minutes, you’ll probably get bored. Again, I don’t myself consider this aspect of the movie to be flawed, but I felt I had to point out that this is a somewhat drawn-out experience. Moving on to my second point, and the only actual gripe, as a Haruhi grand finale, there’s one thing this movie is missing: Koizumi. He’s in the movie, to be sure, but he’s pretty much always just there, contributing very little to much of anything. This being because the film is an adaptation of one light novel in the middle of the full Haruhi Suzumiya series, and he gets his time to shine several volumes down the line, but as this is the end of the anime for the foreseeable future (and likely ever), it’s more than mildly disappointing. Asahina has her moments, Nagato definitely has her moments, but Koizumi doesn’t do anything. He’s just along for the ride, when he’s even along at all. So after taking everything into account (as well as my own subjective enjoyment), on a scale from F to S… If you thought I’d give anything else you really haven’t been paying attention. S. The Disappearance of Haruhi Suzumiya is not only one of my favorite anime movies, it is one of my favorite movies period. It does so, so much right, that the few minor complaints I could muster up aren’t even worth reiterating. In my eyes, it is a triumph on every meaningful level. Being a film, The Disappearance of Haruhi Suzumiya is not currently available for legal streaming from any destination, but Funimation has announced a new Blu-ray release that is slated for 2017. If you would like to see the TV series however, both seasons subbed and dubbed are currently available on Funimation’s website, though the viewing order is a little complicated, and I would suggest doing some research before just hopping in. I personally vouch for the broadcast order.